Our group was founded on having fun first and then throwing pointy things. That being said, we are getting ourselves ready for the local mountain man events in San Diego. Although the rendezvous has lots of attendees, visitors and a walk-through knife, tomahawk and archery course they don't have an actual knife and tomahawk competition. However, they have designed a very devious course. The folks who designed the course have targets that are across streams, so you can't pace off your throws. Some of the targets are high up in the trees, some of the targets are down steep embankments, and some of the targets are fallen oak trees that have been lying on the ground for over 100 years. The wood is much like throwing into a rock! Also, as an added bonus, the targets are surrounded by poison oak so if you miss the target you get to retrieve your knife or hawk in the poison oak. I'm sure you can imagine the laughter when someone's knife skips into the water hazards or the poison oak. However, even though there is no regular knife throwing event we still attend the rendezvous. Since we are San Diego Chuckers we have created our own competition for these rendezvous. When we attend the events we each put $20 into the "knife pot" and $20 into the "tomahawk pot." The winner takes the pot. 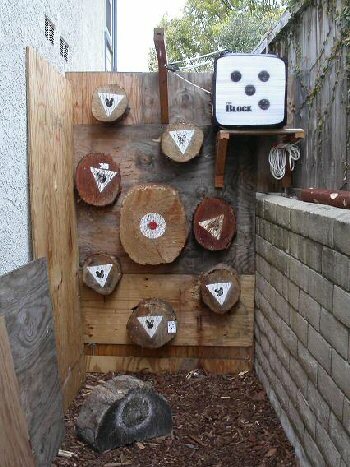 In order to get ready for these events we have redesigned our targets. 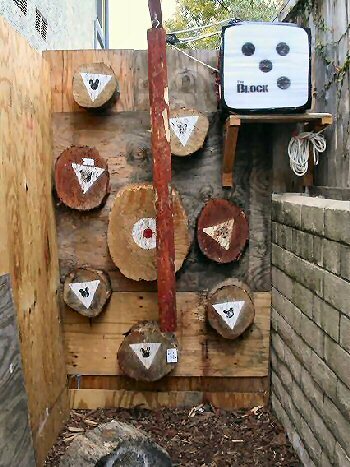 I have sent photos of our "new" practice range, naturally the targets are challenging. The foam target on the right is for archery and blow gun darts, no knives or hawks are allowed. The targets range in height from "on the ground" to eight feet high. Our ground target is seasoned oak that we can place at angles to really test your ability to stick knives in really hard wood. As an added test we have hung a swinging pole that we throw hawks into and then throw our knife into while the pole is swinging. Also, if you just want a little diversion you can swing the pole in front of the targets while you try to hit the target in the back. These targets really test your skills and your concentration. As you know, since you are a San Diego Chucker yourself, we don't take ourselves too seriously. Our purpose is to promote the sport of knife throwing and have a great time doing it. If you can't laugh at yourself don't worry, one or all of the Chuckers will laugh at you for you. Carl and all the other San Diego Chuckers. Want to stick more knives?